Cognitive Behavioural Therapy (CBT): It uses proven practical techniques to resolve many issues by changing the way you think, feel and behave. Sessions are face to face, telephone, or video/Skype and 50 minutes. If a particular treatment is not mentioned below please contact us. Social or public speaking anxiety, phobias, personality disorders. -Assessments and emotional healing and resilience with therapists from similar, close or different cultural or faith background to the service user. Psychological, CBT, cognitive/ neuropsychological assessments. Medico-legal, learning difficulties, personality, and psychiatric assessments. Abusive and neglectful parenting styles with or without addiction, personality or complex trauma issues. Families in conflict or estranged. Children at risk of aggressive or behavioral problems. –For people struggling with major life changes (e.g. coming abroad). -Where mindfulness cognitive behavioral therapy helps to relax, detox the mind and creative dreams born. -For people injured in vehicle accidents or accidents at work. -For families injured due to a false accusation of abuse or children misdiagnosed as abused/ un-abused. -Families injured due to a false accusation of abuse or parents misdiagnosed as unfit/fit parents. -Family reunification of children and parents separated due to fostering or other reasons. – On integrated modern and traditional safer parenting and child protection law. –Culturally and faith sensitive independent psychological and psychiatric assessments of parents’ and children psychological/ mental health needs. -Helps to create a Personal Psychological Profile for individual, family, team and organizational effectiveness. -For emotional resilience and self-help techniques, in particular, to manage exhaustion from a crisis situation or a long-term activity such as looking after a child with a life-threatening condition or involvement with child protection agencies. 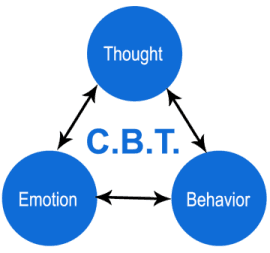 ‘Cognitive behavioral therapy (CBT) is a form of treatment that focuses on examining the relationships between thoughts, feelings, and behaviors. By exploring patterns of thinking that lead to self-destructive actions and the beliefs that direct these thoughts, people with mental illness can modify their patterns of thinking to improve coping. CBT is a type of psychotherapy that is different from traditional psychodynamic psychotherapy in that the therapist and the patient will actively work together to help the patient recover from their mental illness. People who seek CBT can expect their therapist to be problem-focused, and goal-directed in addressing the challenging symptoms of mental illnesses. Because CBT is an active intervention, one can also expect to do homework or practice outside of sessions’. ‘A person who is depressed may have the belief, “I am worthless,” and a person with panic disorder may have the belief, “I am in danger.” While the person in distress likely believes these to be ultimate truths, with a therapist’s help, the individual is encouraged to challenge these irrational beliefs. Part of this process involves viewing such negative beliefs as hypotheses rather than facts and to test out such beliefs by “running experiments.” Furthermore, people who are participating in CBT are encouraged to monitor and write down the thoughts that pop into their minds (called “automatic thoughts”). This allows the patient and their therapist to search for patterns in their thinking that can cause them to have negative thoughts which can lead to negative feelings and self-destructive behaviors’. ‘Studies have shown that CBT actually changes brain activity in people with mental illnesses who receive this treatment, suggesting that the brain is actually improving its functioning as a result of engaging in this form of therapy. CBT has been shown to be as useful as antidepressant medications for some individuals with depression and may be superior in preventing relapse of symptoms. Studies indicate that patients who receive CBT in addition to treatment with medication have better outcomes than patients who do not receive CBT as an additional treatment’. Our CBT therapists and practitioners are Clinical or Counselling Psychologists, other Psychologists, EMDR therapists, CBT therapists, or integrative/other psychotherapists and counselors. Accredited and /or registered with HCPC, BPS, BABCP, BACP, UKCP, EMDR UK & IRL, etc. Dr. Francis Selemo is a Chartered Clinical Psychologist and Accredited Cognitive Behavioural Psychotherapist. Read more. Daniel Mirea is a consultant CBT therapist, lecturer and writer Read more. Caroline Howard, is an accredited cognitive behavioral therapist, clinical supervisor, and trainer. Read more. Beverly Marais is a Counselling Psychologist who is specializing in using cognitive behavioral therapy to help people with eating disorders. Read more. Teresa Blanco Martinez is a Clinical Psychologist in Training who practices cognitive behavioral therapy. Read more. Sonya Tancheva is a business psychologist, and HR consultant, who practices cognitive behavioral therapy. Read more.